Researchers have discovered that acupuncture causes a special biochemical reaction that reduces inflammation and muscle pain. The study, published in Molecular Neurobiology, investigated the effects of needling one acupuncture point on the leg. The research team measured a remarkable effect. Acupuncture point SP6, Sanyinjiao, is depicted in this image. Manual acupuncture stimulation downregulated M1 macrophages (pro-inflammatory cells) and upregulated M2 macrophages (anti-inflammatory cells). As a result, acupuncture reduced pain and swelling. This neurobiological acupuncture continuing education study solves a great mystery, how does acupuncture work? The secret is in the biochemistry. M2 macrophages are an important source of IL-10 (interleukin-10), an anti-inflammatory cytokine that plays an important role in immune responses. Cytokines are proteins released by cells that regulate reactions between cells. Manual acupuncture successfully downregulates M1 macrophages and upregulates M2 macrophages thereby promoting the release of greater IL-10 concentrations. As a result of IL-10 release, pain and inflammation significantly reduce. Acupuncture continuing education in the form of basic research and clinical medicine has helped to measure positive patient outcomes and the biochemical mechanisms by which acupuncture exerts its beneficial medical effects. This latest study helps to unlock one of the greatest secrets of acupuncture, how does it stop pain? Now, scientists can quantifiably measure specific biochemical processes triggered by acupuncture and the resultant positive health outcomes. 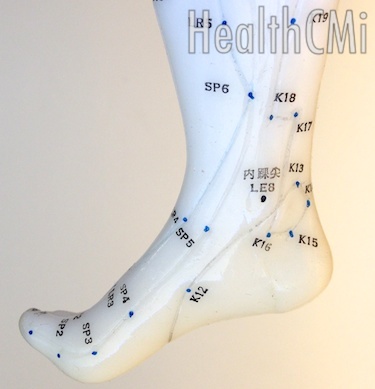 The acupuncture point tested in this investigation was SP6 (Sanyinjiao, Three Yin Intersection). SP6 is located 3 cun directly above the tip of the medial malleolus, on the posterior border of the medial aspect of the tibia. According to Traditional Chinese Medicine (TCM) theory, SP6 strengthens the spleen, transforms dampness, spreads liver qi and benefits the kidneys. SP6 indicated for the treatment of abdominal pain & distention, diarrhea, dysmenorrhea, irregular menstruation, uterine bleeding, leukorrhea, prolapse of the uterus, sterility, difficult or delayed labor, nocturnal emissions, enuresis, dysuria, lower limb atrophy or motor impairment, lower limb hemiplegia, vertigo due to blood deficiency and insomnia. SP6 is the meeting point of the three lower yin meridians: spleen, liver and kidney. A globe and DNA are represented here. About HealthCMi: The Healthcare Medicine Institute (HealthCMi) publishes news and research on acupuncture, herbal medicine and traditional medicine. HealthCMi provides acupuncture CEU and NCCAOM PDA online courses to licensed acupuncturists for acupuncture continuing education credit. To submit an article for publication consideration, visit www.healthcmi.com and click on the contact us link.